Click on the ‘Buy Ice Time’ button to get started. Then enter the state, closest city to where you are looking to search, and then the distance in miles that you would like to look for available ice times. Click ‘Find Ice Time’ to start seeing the results. You will then be taken to the Buy Ice Time page where you will see all of the available ice times that fit your search parameters. To refine your search results use our easy filtering system above. You can set date ranges, times, days of the week, by arena, zip code, and even filter to only show ice times that have the services offered that you are looking for. It’s never been easier to find the perfect ice time based on your individual needs. You can also clear the filter simply by clicking on the ‘Reset’ button. If you would like to get more information on the ice times listed click on the ice time name and you will be taken to an individual page that shows more details including a description of the ice time and even a map showing you exactly where the arena is located at. The sellers contact information is also available here so that you can contact them directly. 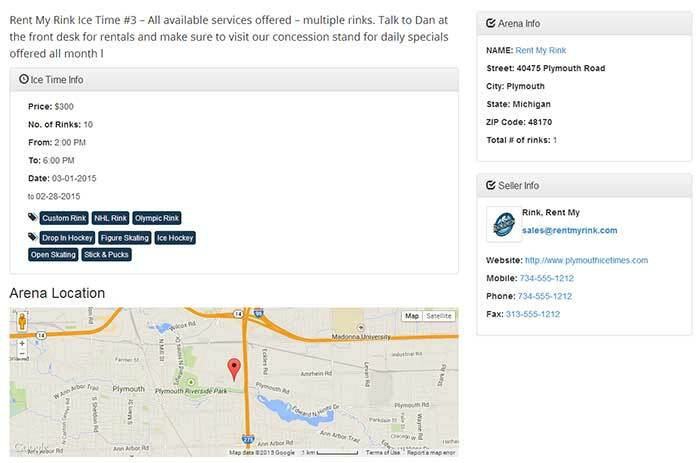 Finding available ice time has never been easier than using our customer search and display system. If you do not find the ice time that you are looking for, simply sign up for one of our Free Subscription accounts. From there you can put in a request for ice time that our arena owners will see. They can then contact you to fulfill your ice time needs.